Ha Long Bay, located in the Gulf of Tonkin, within Quang Ninh Province, in the northeast of Vietnam, is165 km from the capital of Ha Noi. Covering an area of 43,400 ha and including over 1600 islands and islets, most of which are uninhabited and unaffected by humans, it forms a spectacular seascape of limestone pillars and is an ideal model of a mature Karst landscape developed during a warm and wet tropical climate. The property’s exceptional scenic beauty is complemented by its great biological interest. The outstanding value of the property is centered around the drowned limestone karst landforms, displaying spectacular pillars with a variety of coastal erosional features such as arches and caves which form a majestic natural scenery. The repeated regression and transgression of the sea on the limestone karst over geological time has produced a mature landscape of clusters of conical peaks and isolated towers which were modified by sea invasion, adding an extra element to the process of lateral undercutting of the limestone towers and islands. 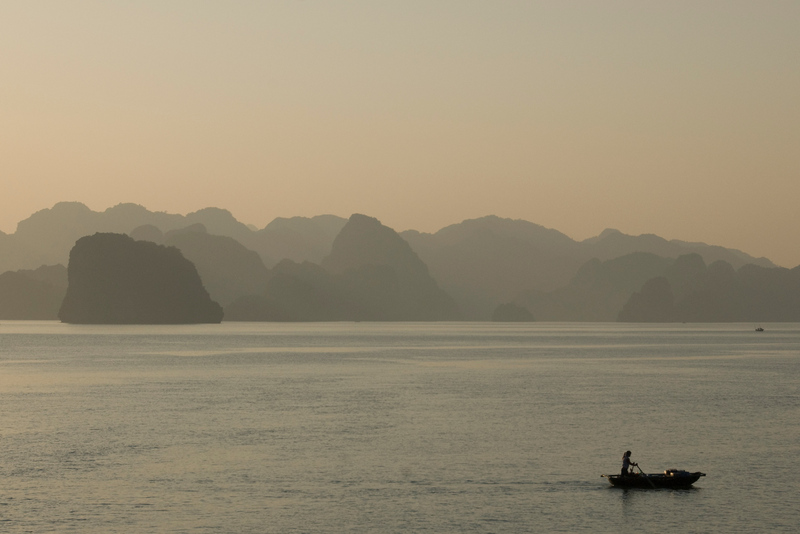 Ha Long Bay might be the best natural heritage site in SE Asia (excluding Borneo). They typical Ha Long Bay excursion will be a 3-4 hour bus ride from Hanoi and a 1 or 2-night stay on a junk in Ha Long Bay. There are also options to stay in nearby Cat Ba National Park. One of the unique features of Ha Long Bay are the women who sell snacks and drinks from their boats. They will row up to the anchored junks to sell things to tourists. The woman in the above photo had a boat full of soft drinks, potato chips, and candy. Ha Long Bay is located in Northern Vietnam and is one of the country’s most popular tourist attractions. Aside from being popular with tourists, it is also a culturally recognized UNESCO World Heritage Site. The bay is well known for its scenic karst topography, which is a subject of many popular photos of Vietnam. Ha Long Bay is made up of a dense cluster of more than 1,600 monolithic limestone islands. Each of these limestone islands is topped with thick vegetation that rises from the ocean. Some of these monolithic islands are hollow though; there are enormous caves within that can be explored (while others remain unexplored). The largest grotto within Ha Long Bay is the Hang Dau Go, also known as the Wooden Stakes cave. At the end of the 19th century, French tourists visited the cave and named it Grottes des Merveilles. It is made up of three large chambers with plenty of stalactites and stalagmites. Within the Ha Long Bay are two bigger islands: Cat Ba and Tuan Chau. These islands have permanent human inhabitants and tourist facilities (such as beaches and hotels). You can also find several other gorgeous beaches in many smaller islands within the bay. Currently, there are four fishing villages within Ha Long Bay. All of these villages combine to have around 1,600 people living in them. The communities are made up of floating houses that get their sustenance through fishing and marine aquaculture. Aside from the monolithic islands, caves and beaches, lakes are important features of Ha Long Bay too. There are plenty of them inside the limestone islands. 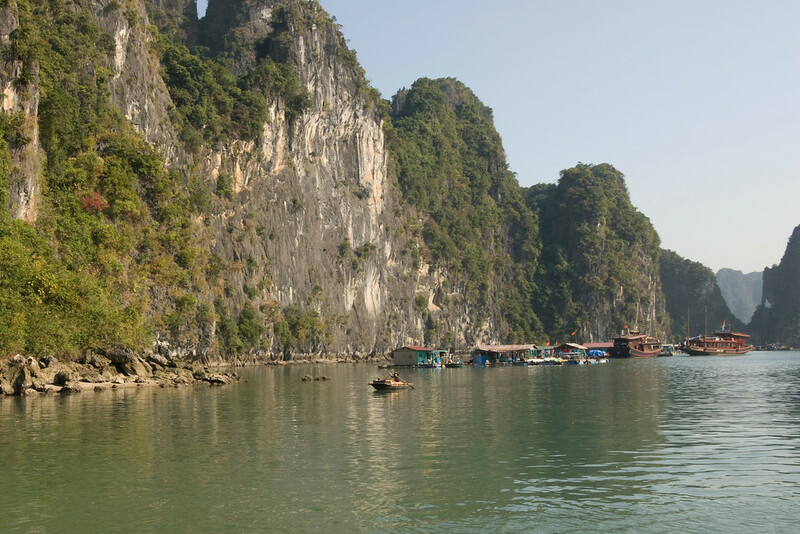 The best way to get to Ha Long Bay is to book a cruise tour. 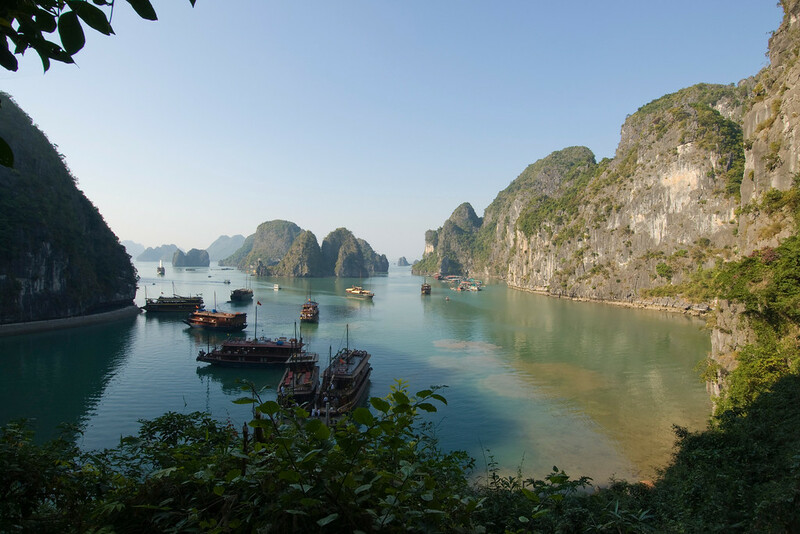 There are several tour companies in Vietnam that provide a cruise on the Ha Long Bay for one day or several days – you can choose your desired package. Either way, this tour will include transfers to and from the bay. It is also a good way to immerse into the way the locals live in the floating communities. If you are traveling to Ha Long Bay on your own, you can go to Halong City or Bai Chay. You must then go to Bai Chay Tourist Wharf to book a boat trip that will take you to Ha Long Bay. 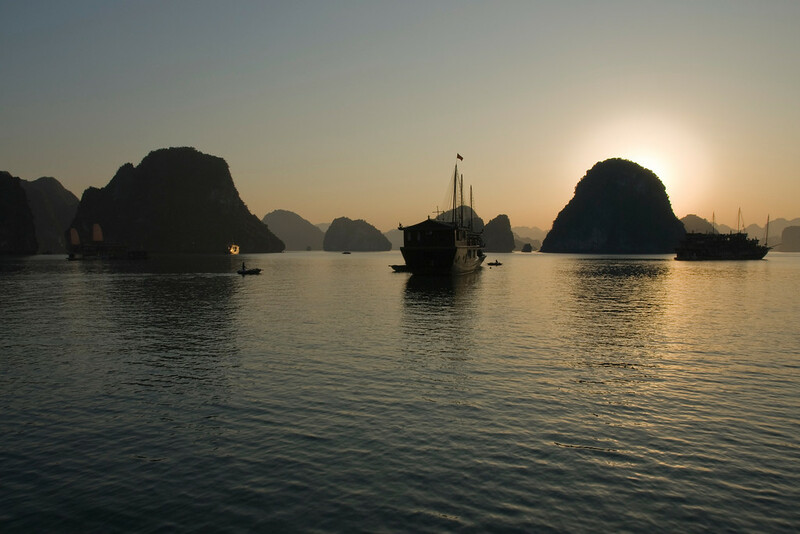 The best time to visit Ha Long Bay is from October to December. This is when the temperature is not too high or too low. If you want to avoid the peak season, do not travel from late May to early August. If you go from May to September, expect a lot of tropical storms. This means that tourist boats are not allowed to cruise the bay when there are storms. When you visit in January to March, that is when the temperature is at its lowest. There is also a lot of fog that could make the visibility level low. I was in Halong Bay in 2007. The view in indeed breathtaking. It's not the cliffs themselves that make Ha Long Bay unique, but rather their sheer number. A huge bay, dotted with nearly 2,000 mostly uninhabited limestone cliffs, the breathtaking scenery is very similar to that of the Andaman coast of Thailand, Vang Vieng in Laos and Guilin in China. I've been to Vietnam 10 years ago. I think the boat in the photo are the ones that sells various goods including souvenir items.